Jockey Jesus Castanon was not seriously injured when he was unseated in Thursday’s ninth race after his mount, Kruthen, stumbled and then fell at the start. “He’s a little sore, but he’s fine,” agent Terry “Jaws” Miller said. 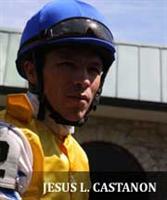 “He will ride today (Friday).” Castanon is named on six horses on the Friday card at Churchill Downs. Jack Bohannon, assistant to trainer Rusty Arnold, reported Kruthen was uninjured as well. From his Facebook page, "I Worked Shackleford We Are Ready for the big show!! This Saturday coming up."